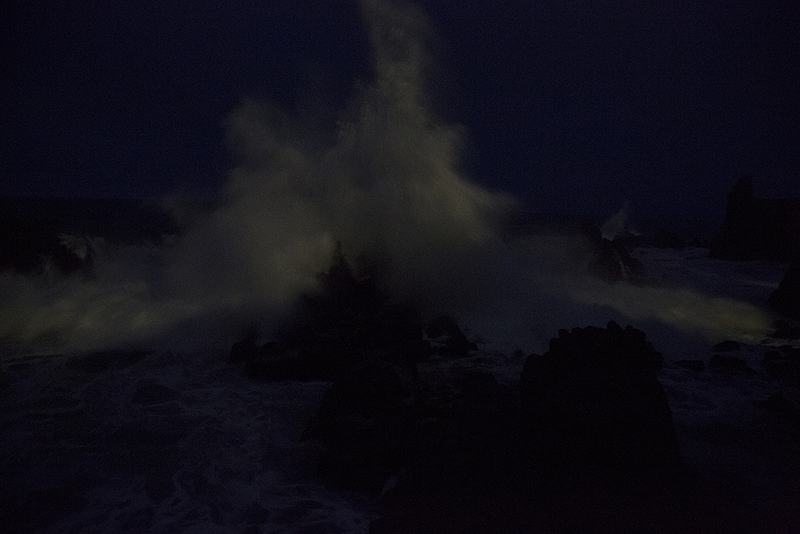 The massive sea at night is ever moving. 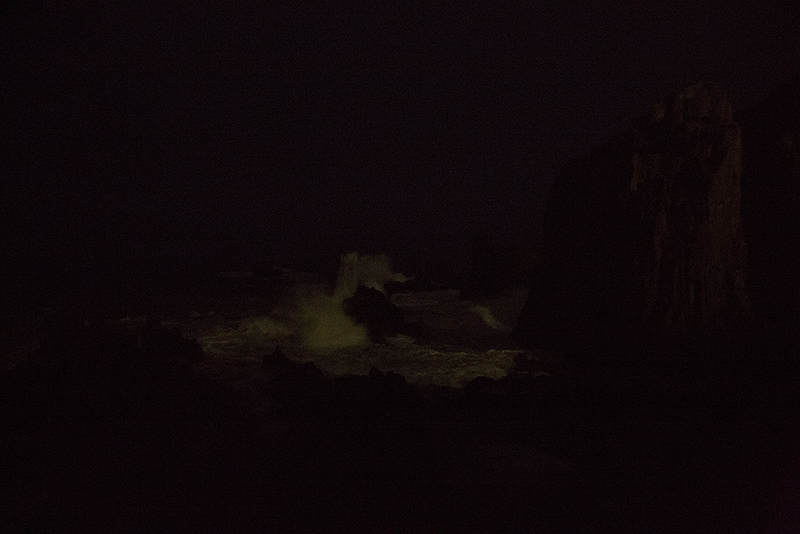 The sea at night is a world of darkness whose appearance changes instantaneously giving rise to countless fleeting relationships. Even the deepest, most complete darkness contains depth and tonality as well as distance and the hint of something present. Although we may not be able to see anything, we can sense it. We can sense islands, peninsulas and bare rocks floating faintly here and there in the stillness of the dark, and even when there is no light at all and we cannot see, we sometimes detect in front of our eyes a phenocryst-like dark grey mist. 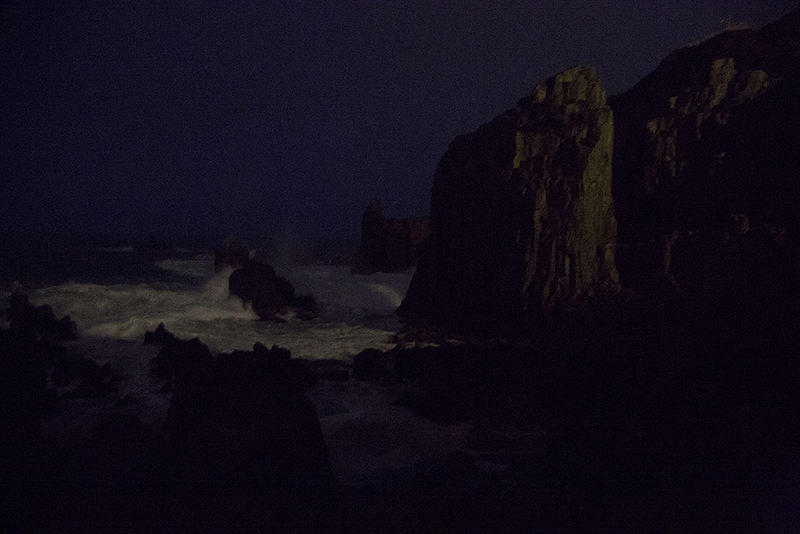 On the sea at night, without the aid of compass or sea chart, our gaze wanders earnestly, carving rugged cliffs, forming swells that surround rocks, carving out knife-like, columnar clefts and shattering in the darkness above, while all the time remaining attuned to the waves and the wind. We shudder at the sea that hides its glistening eyes beneath the waves like the Leviathan, the dangerous and ferocious sea monster from the Book of Job, and bears down on us with its angry waves and deafening roars. 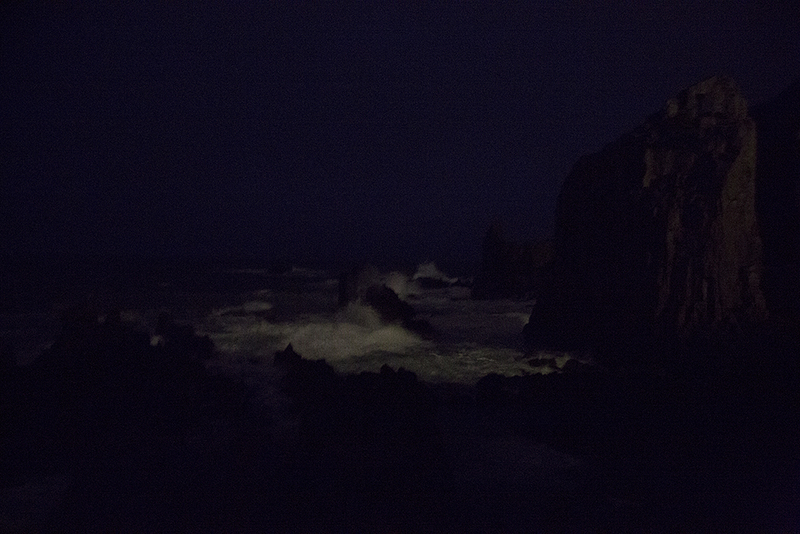 Looking at Yoshihiko Ueda's photographs of the sea at night, it is as if one has lapsed into a preverbal state. Although unnoticeable when viewed from a distance, when viewed up close these large-scale works that call to mind Courbet's seascapes with their wild cliffs and raging waves clearly manifest like the scales of a monster the granular texture peculiar to digital photographs. Red, blue and green particles overlap and flow across the picture plane. The particles of the sea rise up one after another to form wave crests and advance from every point on the far-off, invisible horizon, rapidly penetrating even the slightest of shivers or trances, as if intent on filling every gap. Each individual particle rages and vibrates, seeking at every moment to trace back to the very source of memory itself. These photographs of dark, turbulent seas recreate one-by-one the fragmentary feelings the photographer experienced while gazing fixedly at the sea. While confronting the sea as if it were some kind of spirit that moves the soul and freezes the body, he is enveloped by a powerful force and engulfed by this force that scrapes the depths of his memory. But what exactly is he gazing at? Perhaps what he is gazing at is not in fact the sea at night. Rather, what he is gazing at is a physical murmuring that possesses a life-force of some kind, and it is this that hauls up these deep memories. As if they were living memories that flow through a place. And this murmuring eventually turns into a cry like some kind of magical voice. From "QUINAULT" (1991) to "Materia" (2012), "M.River" (2013) and his recent series depicting the activities of people gathered on the banks of the Ganges River, Yoshihiko Ueda has continued to take photographs that focus on those aspects of nature in which the passage of time recurs again and again and accumulates. Forests, rivers, trees, people, the sea… In the process of photographing these things, it would seem that there has been a significant change in the way Ueda looks at nature. It would also seem that as a result of this change, the photographic methods and formats he uses have also changed, so that he is now interested in dimensions and aspects of nature different from those in which he was previously interested. The relationship between himself and nature has changed, as has the relationship between himself and photography. Perhaps these are changes that could be expressed is a variety of ways, such as a shift from analog photography to digital photography, from pan-focus to out-of-focus, from external nature to internal nature, but it is particularly noteworthy, I think, that these changes are strongly linked to the fluctuation and direction of MEMORY in capital letters. Ueda is able to accept as is without any resistance the vibrations that arise from the raw, fluid experiences of nature themselves. The "forests" and "seas" and "rivers" described by words begin to crumble, and in their place arises joy. 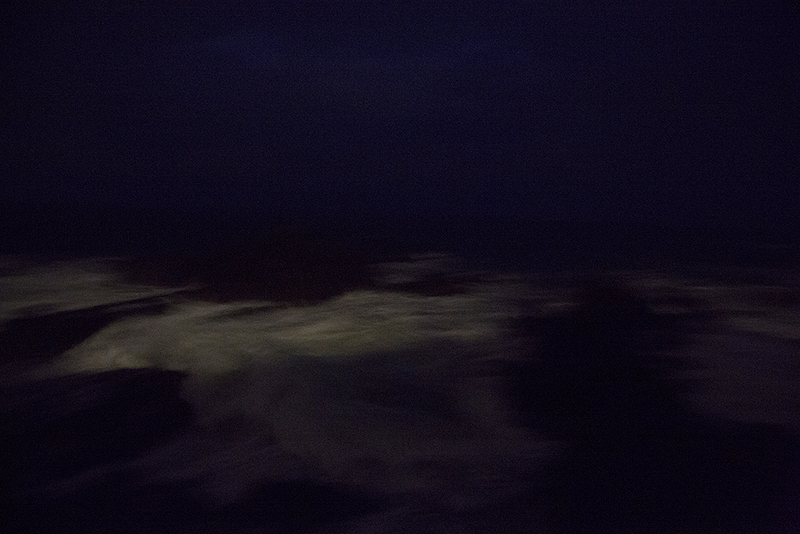 When we gaze at the sea at night, there is something that despite being invisible becomes visible. This thing is not entirely new, and the impression we have is akin to having stumbled again across something buried deep in our unconscious. At this time, perhaps what we witness is a mysterious sympathetic process in which a single exquisite spiritual web is being woven, as it were, from an assemblage of various fragmentary feelings. This gives rise to an intimate sense of joy. It is the joy that comes from seeking to capture forests, rivers, trees, people, the sea and other manifestations of nature and in the process realizing that what flows at the heart of these things flows in a similar way within oneself and from being able to step into this flow. 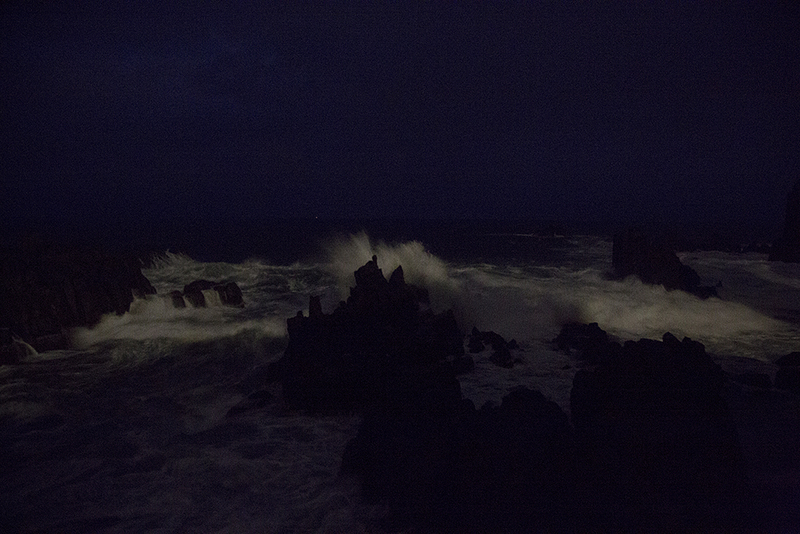 Looking at the flowing darkness of the sea at night. Not looking at the light, but gazing at the ceaselessly flowing darkness. Looking at the darkness, not at the light, is the beginning. We need to physically experience the beginning of everything, again and again we have begun by looking at the darkness. 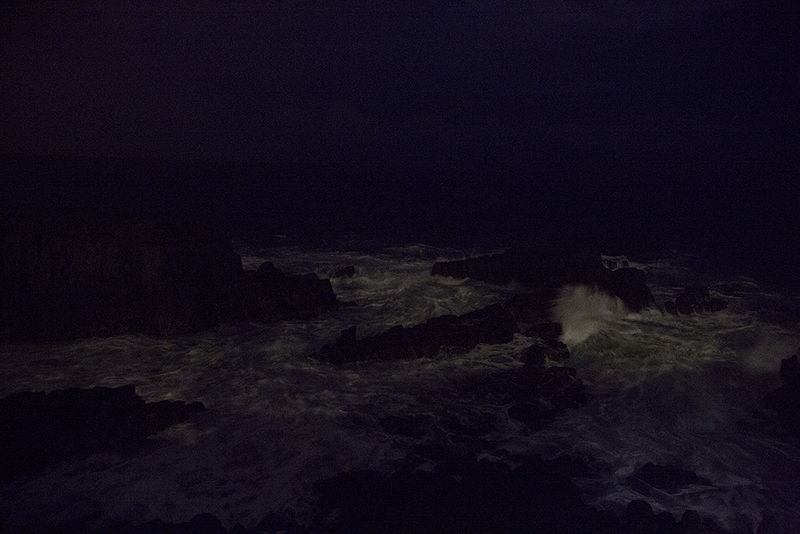 The turbulent sea at night asks questions of the viewer regarding the orgins of this beginning. 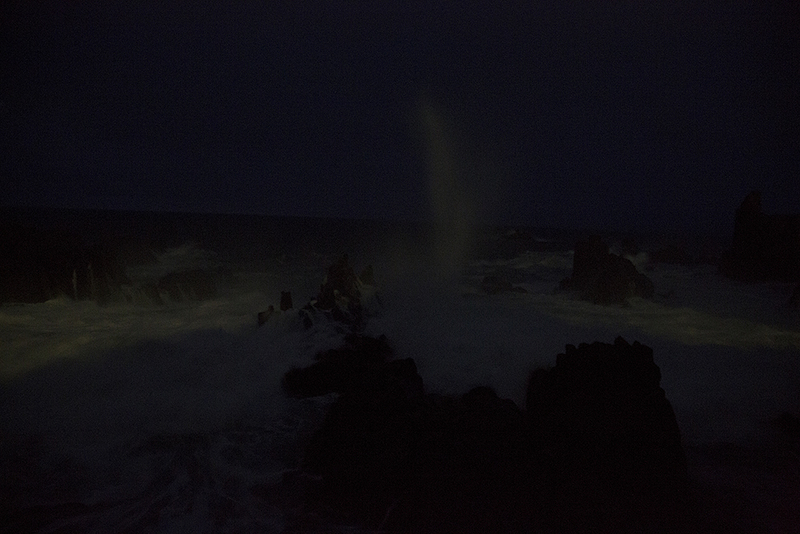 The appearance of the sea at night, becoming mass and surging in, sinking back into darkness, changing shape again and again, at times almost singing and at times almost shouting, swirling and collapsing, moves us deeply, frightens us, and then releases us again. 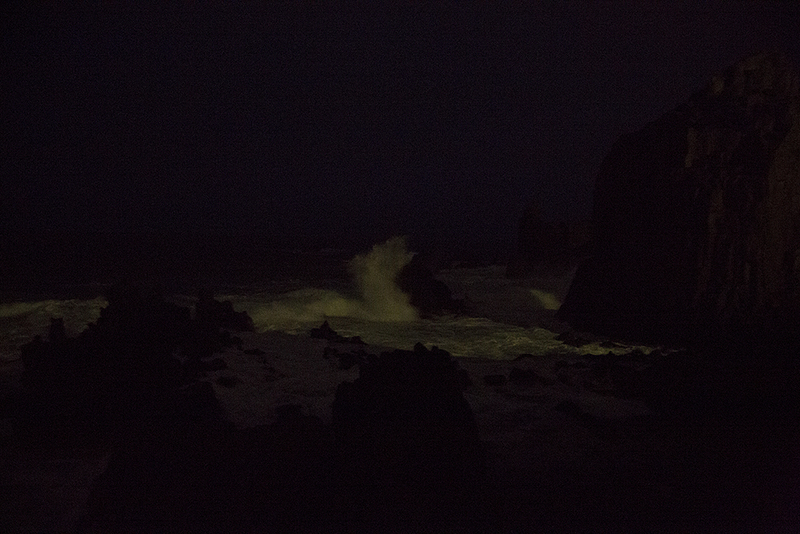 The sea at night has the power to change the way we experience the world, the way we experience the everyday, into something quite different. The world we see is not completely stable. The "blocks" that make up the sea with its constantly changing appearance open the door to different memories within us and remind us that it is water that gives rise to the links and relationships between different life-forms. Just as our genes hide information about individual life-forms, the sea contains within the particles that make up its abundant waters information relating to a variety of life-forms. The particles of the sea in which vibrations and memories relating to these life-forms are stored are at the same time the most important matter for stimulating memories and mediating memories. This is why life was able to begin in the sea. Life does not reside in living organisms; rather, living organisms exist within life. Come to think of it, humans, too, spend a long time in aquatic surroundings, experiencing the dark, fluid world of the womb as if in the sea. In humans, too, there flows a layer of "water as memory" that cannot be torn away. 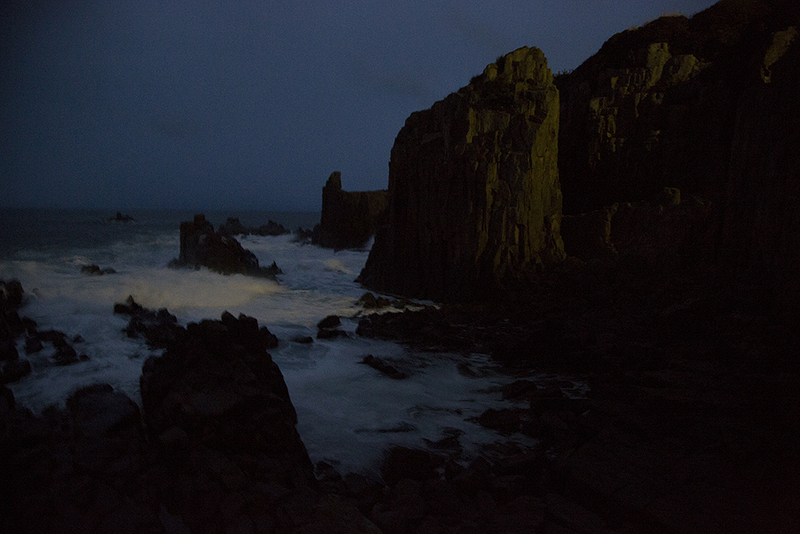 At the edge of the sea at night, one is strongly reminded of this fact. And along with this primordial memory, we able to experience seeing a beginning we have never before seen. We sense that we are penetrated by a force like a giant vortex in the universe through which ourselves and the places in which we reside flow. Like liquid memory life-forces, Yoshihiko Ueda's photographs of the sea at night communicate to us the echoes of this beginning. Born 1957. Among his most noted series/monographs are Quinault (Kyoto Shoin, 1993), a brooding meditation on the eponymous sacred Native American rainforest; Amagatsu (Korinsha, 1995), a backstage study of Sankai Juku dancer-choreographer Ushio Amagatsu; Portrait (Littlemore, 2003), singular impressions of 39 leading Japanese figures the likes of Takaaki Yoshimoto and Shotaro Yasuoka; At Home (Littlemore, 2006), intimate snapshots of the artist's family; Yume (Seigensha, 2010), timeless, dreamlike images from a Buddhist monastery in Mandalay; and Frank Lloyd Wright (X-Knowledge, 2003), a portfolio of the architect's buildings documented with a Leica. Since 2008, Ueda’s work has been exhibited at Paris Photo, among other art fairs. His “QUINAULT” photographs were featured in solo exhibitions at Michael Hoppen Gallery (London) and TAI Gallery (Santa Fe) in 2010 and his “Materia” photographs of primeval forest taken on the island of Yakushima at Gallery 916 in 2012. He released his “M.River” series of out-of-focus images of ancient streams in the mountains of Yakushima in March 2013, and in May, his “M.Sea” series of digital photographs taken with a single-lens reflex camera of the Sea of Japan from the Tojinbo cliffs of Fukui Prefecture, and in November, his solo exhibition were featured at Galerie taménaga France. His works are in the collections of the Kemper Museum of Contemporary Art (Kansas City), New Mexico Arts (Santa Fe), Hermés International (Paris), Stichting Art & Theatre (Amsterdam), and Bibliothèque nationale de France.